The Queen City Brewing Company was founded in 1901 and located at 208 Market Street in Cumberland. It was famous for its "Original Old German" Premium Lager Beer”. Originally known as the German Brewing Company the company’s name was changed to Queen City in 1941 and remained such until the brewery’s closure in 1974. 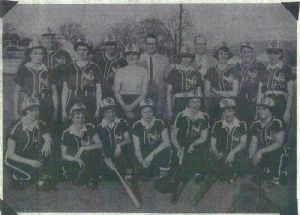 This photo depicts one of the original "Old German Hermanettes" teams which the company sponsored in the city women's softball league. According to Beverly Warnick who joined the team in 1956, the photograph was taken in 1954 or 1955, but most likely 1954. The Hermanettes, often referred to as the "Oh Gee" gals often played teams in Pennsylvania, Ohio, West Virginia, New Jersey and Virginia, as well as participating in softball tournaments throughout the east coast. As displayed on the team uniforms, the mascot for Old German Beer was "Herman (the German)", a little cartoon figure dressed in traditional attire. Shown are, front row, left to right: Cora Leatherman, Darlene Weimer, Darlene Lease, Annabell Leatherman, Elsie McKee, Rosalie Bowers and Dot Heavner. Second row: Jeanne Hale, Becky Lechliter, Pat Metzger, Pat Thompson, Nancy Belt, Francis Duckworth (Assistant Manager) and Eileen Hite. Back row: Ed McGee (Assistant Manager), Gene Scaletta (Manager), L.N. Duncan (General Manager of Queen City Brewing Company), Arch M. Hutchison Secretary of the Queen City Brewing Company). According to a July 6, 1955 article appearing in the Cumberland News, Patricia "Pat" Thompson, pitching ace of the Old German Hermanettes Softball team, suffered a mild concussion at Minke's pool when she was struck in the head by someone diving into the pool. Thompson was taken to the hospital where her condition later improved and she was sent home. However, Manager Scaletta postponed a game scheduled with Elizabeth, Pennsylvania that same day due to the injury. Note: This photograph is taken from a Cumberland newspaper article hanging in Don Gibson's Windsor Barber Shop. The article was provided by Edward Martin, who contacted former Hermanette team member, Beverly Warnick, who provided the approximate date for the image.